Web citations are a great tool. One of the things we’re pretty good at is SEO or search engine optimization. SEO is used to make sure that the search engines, (mainly Google) give your site a high ranking so that it show up on the front page of search results for your industry and keywords. address, phone number, web address, email address (if requested) with the same exact details every time you get another listing on a directory or listing site. These citations give your site more and more credibility and a higher ranking on Google. The backlinks help a ton too – especially from high ranking sites like in the image. 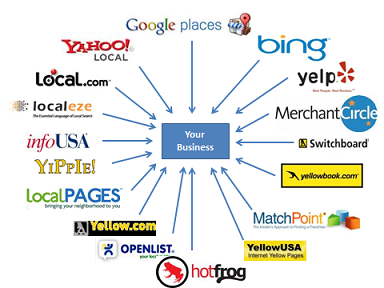 Don’t know where to list your business and get your web citation? Which business directory sites should you list on? Are there some you should avoid? I’m be creating a separate page listing the sites that we use to get web citations and maybe even a couple that we avoid. It will be constantly updated, so check back often. If you have any suggestions to add to our list, or want to share yours, please contact Virtually Famous Marketing.